Dozens of refugees arrived in Greece by sea in July 2015, mainly from countries experiencing war and conflict. The European Union should establish a human rights-based, coherent and comprehensive migration policy which makes mobility its central asset, a United Nations expert today advocated, assuring is the only way in which the EU can reclaim its border, effectively combat smuggling and empower migrants. “Let’s not pretend that what the EU and its member states are doing is working. Migration is here to stay,” Mr. Crépeau stressed. “Building fences, using tear gas and other forms of violence against migrants and asylum seekers, detention, withholding access to basics such as shelter, food or water and using threatening language or hateful speech will not stop migrants from coming or trying to come to Europe,” the UN Special Rapporteur on the human rights of migrants, François Crépeau, said. “If Europeans want their governments to regain control of their borders, then they must urge them to bank on mobility and offer migrants and asylum-seekers official channels to enter and stay in Europe,” the human rights expert said. “Opening up the regular labour markets through smart visas allowing people to come to look for work and incentivize them to return if they don't find the job in question would allow for a much better regulated and controlled official labour market,” Mr. Crépeau noted. However, he cautioned, such measures must be supported with sanctions against employers who exploit irregular migrants in underground labour markets. “This would considerably reduce the pull factor they exercise on irregular migrants and further reduce the market for recruiters, smugglers and exploitative employers,” the expert explained. Welcoming the positive steps taken by the EU in rescuing migrants and asylum-seekers at sea so far, Mr. Crépeau however warned that rescuing people who arrive by sea and then turning a blind eye to their plight leaving them vulnerable to human rights violations is irresponsible,” the expert said. The UN Special Rapporteur warned that the political and popular discourse in Europe has seen a race to the bottom in the anti-migrant sentiments and use of inappropriate language which is often linked to criminalizing migrants. “Migrants are human beings with rights. When we dehumanize others, we dehumanize ourselves,” he underscored. Speaking on behalf of the United Nations Refugee Agency (UNHCR), Melissa Fleming also called for refugees to be treated humanely and for the authorities to work together, as thousands of people continued to head into the Western Balkans from Greece. “UNHCR appealed to the Governments involved to implement border management measures with humanity and in accordance with their international obligations,” during a press briefing, adding that family unity and protection of persons with specific needs must be upheld. In Serbia, UNHCR and the Serb authorities are working to respond to the humanitarian needs of the more than 10,000 refugees. “At the Greece-The former Yugoslav Republic of Macedonia border, people had been continuing to cross in groups of up to 300-400 and then travelling onwards by train or bus to Serbia. Currently, UNHCR anticipated those arrivals continuing over the next few days at a rate of up to 3,000 people per day,” added Ms. Fleming. An equitable redistribution of refugees and asylum-seekers across the European Union was needed, the spokesperson stressed. 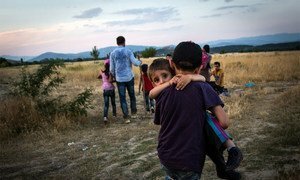 The United Nations refugee agency is assisting refugees and migrants amid chaotic scenes over the weekend as thousands of people tried to cross into the former Yugoslav Republic of Macedonia (FYROM) from the Greek border.